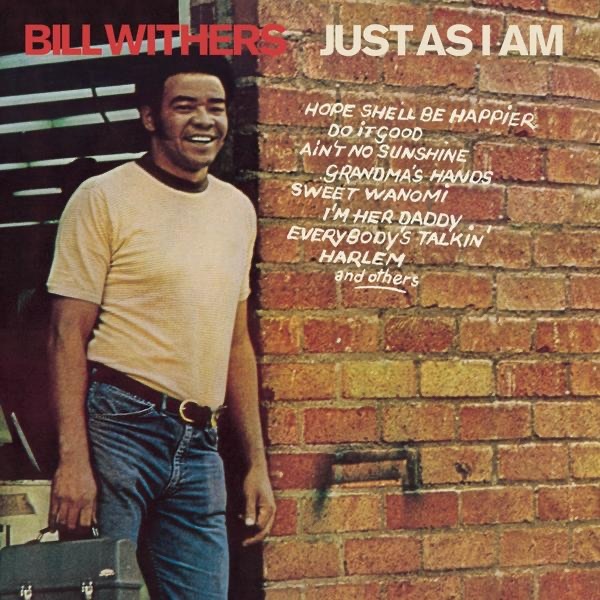 Bill Withers (that’s the great…) came late to making records. Born in 1938 in Slab Fork, West Virginia he joined the US Navy at 18 where he served 9 years before settling in Los Angeles, working a day job to finance his demo tapes while performing at night. His luck changed in 1970 when Sussex Records signed him to make an album. Sussex had a producer who was new to California but an old hand behind the studio desk. Booker T Jones, off of “& the M.G.’s”, had gotten tired of working too hard for too little financial reward at Stax in Memphis. He married Priscilla Coolidge, Rita’s sister, relocated & was looking for new challenges. For “Just As I Am” (1971) Booker T called in his old rhythm section Al Jackson (drums) & Duck Dunn (bass), Stephen Stills brought along some L.A. friends. The first single, “Ain’t No Sunshine”, you know it, sold over a million copies, made the US Top 10 & was awarded the Grammy for the Best R&B song of that year. Bill Withers, reluctant to quit his job making toilet seats for Boeing 747’s, became an unlikely & deserving star. “Just As I Am” hits the ground running with the evocative, picaresque “Harlem”, “Ain’t No Sunshine” a sure-fire smash, the touching, universal “Grandma’s Hands” & the sheer class keeps on coming. Bill was no Soul shouter, his direct Folk-Gospel suitably framed in simple, driving arrangements with taut string flourishes. A cover of Lennon & McCartney’s “Let It Be” is more successful than Fred Neil’s “Everybody’s Talkin'” but it’s the mature plainspeak of his own lyrics that marks Bill Withers as an outstanding, individual talent. The sad & beautiful “Hope She’ll Be Happier”, a late-night broken hearted farewell to an ex, never fails to affect. 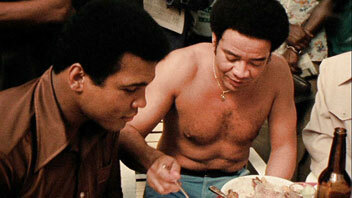 This performance is from 1974, a highlight of a concert in Zaire arranged as part of the Ali – Foreman rumble. The cameras stay on the singer & his authentic Star Power is confirmed. When Bill had to go to work at his new job he knew just the crew to to share the stage with. Keyboard player Ray Jackson had assisted him with those early demos. Ray’s fellow members of Charles Wright & the Watts 103rd St Rhythm Band, Benorce Blackmon (guitar), Melvin Dunlap (bass) & the inimitable drummer James Gadson all handed in their notice & joined Bill’s band. The evidence of just how good they were is right here & on the Y-tube there is a half hour show from 1972 which touches greatness. They all knew it too, enjoying laying down the coolest, in-the-pocket groove. They did it sitting down, imagine how good they would have been if they had stood up! The band, with percussionist Bobbye Hall, recorded & produced the next LP “Still Bill” (1972) which hit the same spots & more. The modern day hymn “Lean On Me”, you not only know that tune but you know the words too, was a US #1 while the sensual “Use Me”, not just the hook of the year but one for all-time, peaked at #2. No-one else’s songs this time just great originals like “Who Is He (And What Is He To You)?”, a typically accurate encapsulation of jealousy covered most successfully by groups with female leads (Gladys Knight & the Pips, the Soul Children). The best tracks…it’s a list but I hear the joyous funk of “When I’m Kissing My Love” & I’m singing it for days. 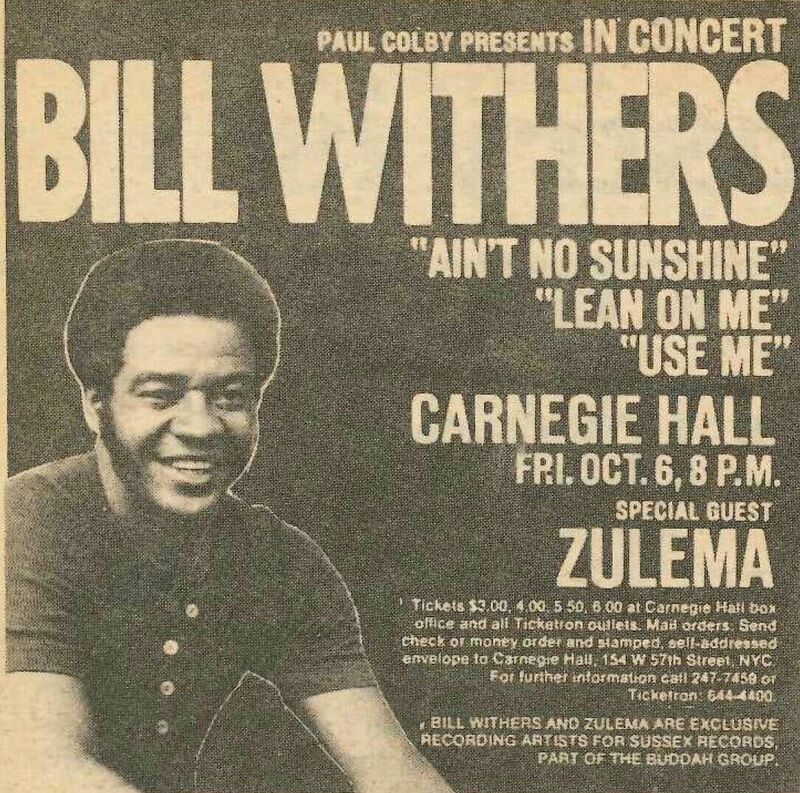 The following year the Bill Withers gang released “Live at Carnegie Hall” & what a life-affirming disc that is. The hits are played, “Use Me” twice, & enthusiastically received by a full house. The singer’s & band’s performances have a little more drive & grit than on studio recordings & that’s nothing but a good thing. The 5 new songs include the empathic “I Can’t Write Left Handed” about a young man who lost an arm in the Vietnam War. Bill didn’t write polemics, didn’t involve himself with the politics of the day. His stories about himself & others contain a sensibility that is more enduring than strident sloganeering. “…Carnegie Hall”, with the long revivalist encore of “Harlem/Cold Baloney” is one of the great live albums. These three albums are the imperial phase of Bill’s career. He could take his seat at the top table of Soul alongside Marvin, Stevie, Curtis & others. After this the business of the music business started to get in the way. “+Justments” (1974) is a fine record, the last with his band & possibly a little rushed. Sussex Records was closed by the Inland Revenue & Bill was left hanging before signing with Columbia. In no way should his time with a major label be dismissed, the records are still warm & individual but a production gloss moves him away from his original sound & the company often rejected tracks while making inappropriate suggestions for material. Bill tells a great story about white “blaxperts” insisting that Elvis’ “In the Ghetto” was the song for him! There were still successes. “Lovely Day” (1977) became yet another of Bill’s songs that entered the public consciousness. A collaboration with Grover Washington, “Just the Two of Us” won the Grammy for Best R&B Song in 1981. It’s not just the hits, on every record there are songs & vocal performances that deserved a wider hearing. In 1985, after a 7 year hiatus, he released an album including the slow jam “Something That Turns You On”. Some of the songs on “Watching You Watching Me” were ones that had previously been rejected. Bill had a life before touring, recording & promoting product & now, happily married with a young family, he stepped away from the business & rarely recorded again. In 2009 the documentary “Still Bill” brought the reticent star back into the public eye. It’s a portrait of a 70-something man who has lived a good life well & learned some stuff along the way. Bill Withers is not only a very, very nice man his domestic, grounded Zen wisdom, still unimpressed by the star-making machinery, marks him as an admirable person. A highlight of the film is when he joins guitarist Cornell Dupree onstage for “Grandma’s Hands”. Two maestros doing what they do to the delight of the audience, to myself & to pretty much everyone I know. Accolades have come Bill’s way, a Wonder (Stevie) & a Legend (John) assisted him in his induction into the Rock & Roll Hall of Fame. It is the four or five songs of his that everyone knows & others that we should know that mark him as an outstanding, abiding artist. The full documentary is on the Y-tube so if you have 70 minutes to spare. Hey, make sure you see it.